froYo is premium self-serve frozen yogurt that proves great taste doesn’t require a sugar and fat overload (yeah, we’re looking at you, ice cream). Choose from our nonfat, low fat, dairy-free, or no sugar added options, and you’ve got yourself a cup of guilt-free indulgence. What’s more, each cup of froYo contains live and active probiotic cultures that help regulate your digestive system, and we have a variety of flavors that are gluten free. Stop by and make a frozen treat that’s both yummy and great for your tummy too. 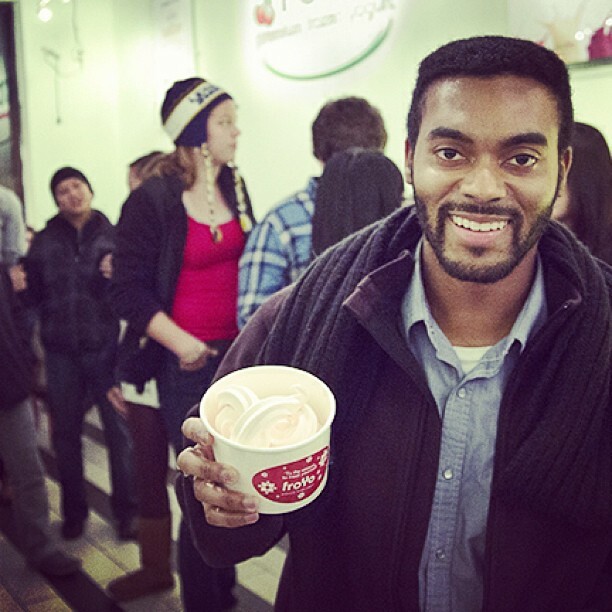 At froYo, purists and customizers alike are welcome. Choose your age-old favorites like Original TartTM or New York Cheesecake, or relive your childhood moments of wreaking havoc at the soda fountains—run your cup down the dispensers for a mix-and-match dessert born of our numerous flavors (go ahead, we know you want to!). Fancy some juicy strawberries with that? Blueberries, mango, or mochi? You got it. Bring your pièce de résistance over to our toppings bar, where you can choose from a wide selection of fresh fruit, nuts, and candy. Visit one of our nine locations in the St. Louis metropolitan area or contact us to schedule a catering or private event!